The thrust is that the United States of America is toast, or at least pretty close. Closer than it has been in 250 years — not that Moore thinks the country has ever lived up to its branding as a place of liberty and justice for all. (His own brand wouldn’t exist if he did.) But the Constitution, imperfect as it is, is only as strong as the democracy that protects it, and the democracy that protects it is only as strong as… Thereby hangs his tale. It must be said that Fahrenheit 11/9 is something of a bait-and-switch. It opens funny, if you can forget for a second the broader narrative. 11/9, of course, is the day (it was early a.m.) that Donald Trump became president-elect, and Moore’s prologue and first section is a Greatest Hits collection of low points: from the media’s certainty he’d never win a primary/the nomination/the presidency to the certainty of Hillary Clinton and her followers that no halfway intelligent country would elect a vulgar, boastful, racist, misogynistic grifter. But after making the case that Trump’s presidency can be blamed on Gwen Stefani (hint: it was her salary on The Voice), Moore offers a hilariously annotated list of since-dethroned male harassers harassing Clinton about her e-mails and/or competency to occupy the Oval office, and then demonstrates how “the malignant narcissist played the media for suckers.” He includes himself. He once had a bit of fun with Trump on Roseanne Barr’s short-lived yak show, grinning when Trump said he loved Roger & Me and hoped Moore would never make a film about him. Moore follows with a somewhat amusing but generally icky montage depicting Trump’s lechery towards his daughter. 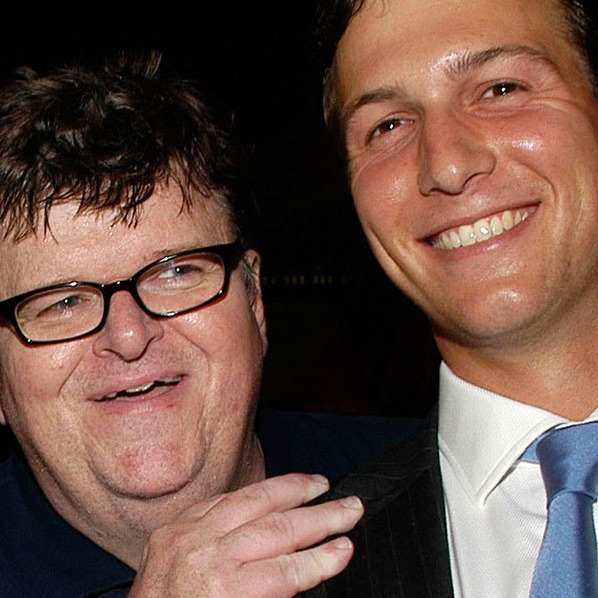 Moore is barreling along when he segues to a spiritual cousin of Trump, Michigan governor Rick Snyder, a very rich man who joined the government in order to privatize it. And then comes Flint, the laughs stop abruptly, and Fahrenheit 11/9 becomes a story of criminal Republican malfeasance, establishment Democratic uninterest and/or impotence, and the rise of local activism that rattles the poohbahs of both parties. We get Flint because it illustrates one kind of malignant governance. Snyder decided to build a second pipeline from Lake Huron (the existing one worked fine), drew water in the meantime from the ghastly Flint River, and ignored evidence that elevated levels of lead were sickening children—and permanently damaging their brains. Here’s the sort of rhetoric Moore does best: He portrays Snyder as criminally indifferent to the poisoning of poor and black children (Moore calls this “a slow-motion ethnic cleansing”) while incensed when General Motors complains that Flint water is corroding the steel in the cars still being made there. When the world premiere screening audience heard that Snyder restored the Lake Huron water to GM but not residents of Flint, there were gasps. Moore gets a few cheap laughs when he goes to the state capitol to make a citizen’s arrest and then deluges the governor’s lawn with a truckload of Flint water. But it was the efforts of Flint mother LeeAnne Walters; Dr. Mona Hanna-Atisha; and the previously little-known whistleblower April Cook-Hawkins, who refused to follow orders and reduce the levels of lead on a report of children’s blood tests, that Moore is here to celebrate. They’re “ordinary” people who stepped up in the absence of politicians — among them President Obama, who visited the community but declined to declare a national disaster, offering only words of encouragement, and, in an uncharacteristically tone-deaf move, pretending to drink Flint water while only wetting his lips. Later, Moore notes that disgust with the Democrats kept many Flint voters from the polls in that vital Midwest state. It went narrowly for Trump. This entry was posted in Extinction and tagged politics, Trump by Exposing the Big Game. Bookmark the permalink.